Add an element of grandeur to your interior with these effortlessly chic designs. 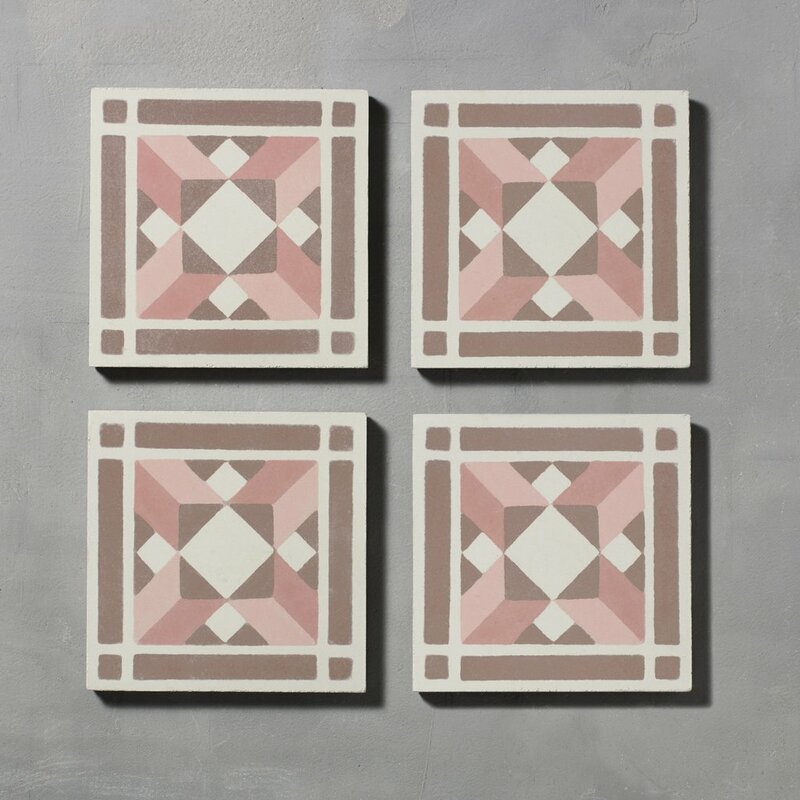 Taking inspiration from elegant Parisian interiors, our Camille tiles will add a certain je ne sais quoi to any floor or wall in a hallway, kitchen or bathroom. Drawing inspiration from Parisian hand-painted terracotta tiles, the Camille tile will make an elegant feature in your hallway or bedroom. The soft grey and cherry colour palettes and traditional pattern exudes old-world charm, with a modern twist. 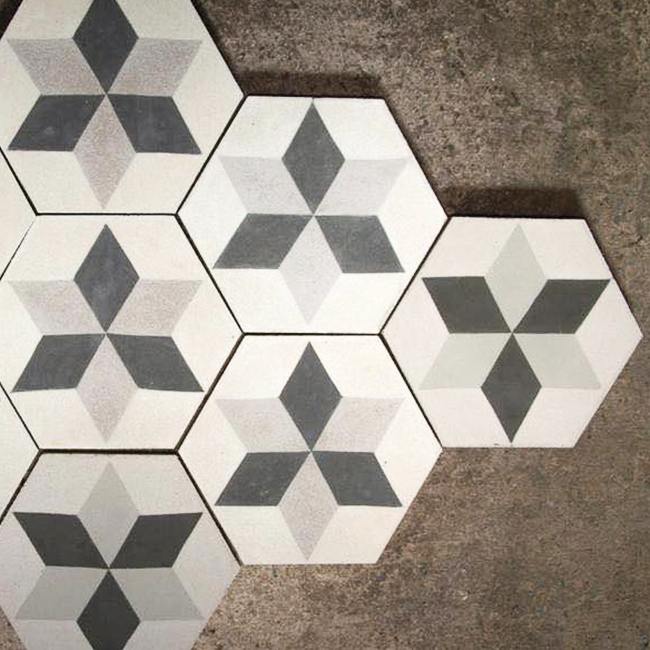 We are looking for a space for our Camille tiles to make their debut. Love our latest designs? Can you see them making a grand entrance in your hallway? Or as a stunning commercial space? Then we would love to hear from you. We are looking for one unique space to collaborate with. We will supply the tiles at 50% discount and once fitted we will come to style and shoot your space. Email tom@bertandmay.com to enquire, we'd love to collaborate with you. In the design lab. Mixing the natural green pigments, creating the mould and pouring the tile to the finished piece. The latest range from Design Lab is here, the place where we explore and innovate our creative ideas. Some inspiration comes from a reclaimed find that sparks off a new creative direction. And that is exactly what has taken place here with our latest Organics range. Comprising of 3 new designs, the background of Organics has come from within the Bert & May ethos and it epitomises the more casual Bert & May style. It’s about relaxed living, we’re picturing lazy Sunday lunches in a light wood clad kitchen diner, lots of friends around the table, sun shining through the windows, lots of greens, whites and natural woods. Reclaimed finds naturally give a relaxed lived in feel to any space and the tile designs were born out of love of this look. Leaf. A design based on an old antique find. Reminiscent of leaves. This gorgeous garden room has such a lovely feel, full of greenery. Stem. Created from this Spanish find, the original can be seen on the right in Casa La Siesta. But this is more than the tiles, this is about a lifestyle that we want to share, the more casual Bert & May, softer and for everyday living. Timeless and effortless. We are on the look out for a kitchen, conservatory or even an orangery to showcase the new collection. We are looking for somewhere for Organics to make it’s debut. Love this look? Can you see it working for your latest project? Then we would love to hear from you. Email ruth@bertandmay.com we would love to collaborate with you. A new addition from Design Lab is here, the place where we explore and innovate our creative ideas. 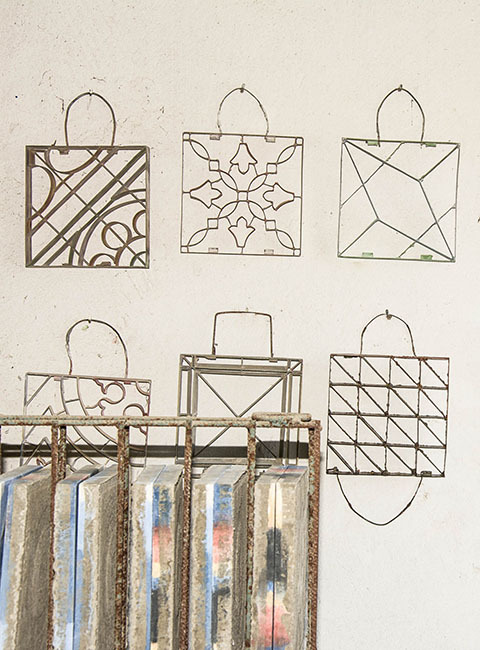 Some inspiration comes from a reclaimed find that sparks off a new creative direction. And that is exactly what has taken place here with the Eugenie. This is one of our all time favourite reclaimed designs. We love it for it’s muted chalky finish. We found just 72 of these tiles several years ago. 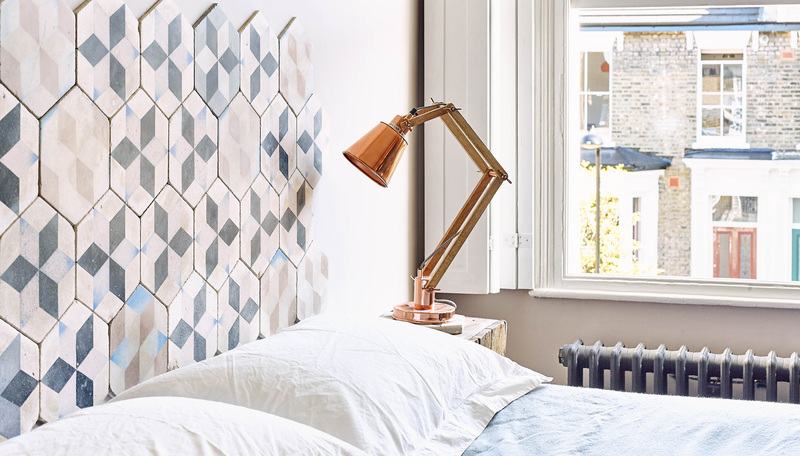 Enough to create a truly unique space like this iconic bespoke headboard. Such has the love been for this design that we have gone into our design archives and we are creating three new versions of this loved design. We are now looking for a space to feature this tile. We are on the lookout for a bar, restaurant or retail space for Eugenie to makes it's debut. Love this look? Can you see it working for your latest project? Then we would love to hear from you. Email ruth@bertandmay.com we would love to collaborate with you. We will supply the tiles at 50% discount and once fitted we will come to style and shoot your space. We are in the process of creating three variations of this loved design. A new mould based on the original find has been made and then colours developed and mixed to create the first in the trio. We are passionate about the look and feel of the old and have developed a bespoke technique of mixing our pigments with the raw materials. The variations in the finish, where the colours are in part transparent revealing the base material of the tile is what gives in that chalky, pared back look. And one that will be unique every time The exact same pigment can never be remade, once a batch is made and used the creation will always be slightly different. The depths of the colour, the areas of transparency, the grainy feel will always vary. Meaning the look of the Eugenie is a very special collection. The first in the trio is our old iron grey a slightly more polished variation. These strong statement yet classic designs will work beautifully in a contemporary or period setting. 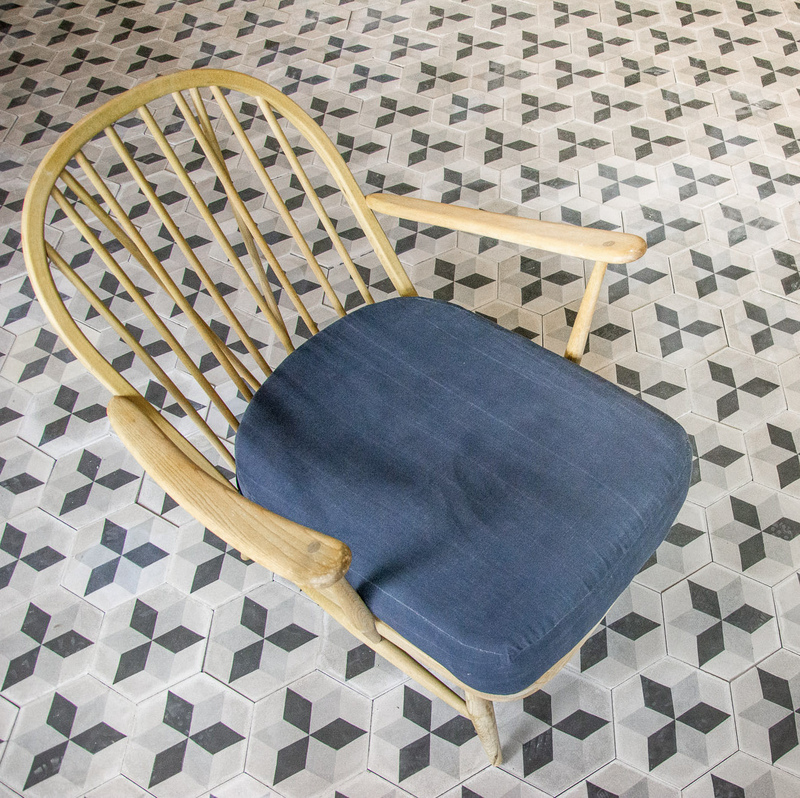 Our plain hexagonal tiles work well with this look too. The natural tones and pigments and washed out finishes bring this design aesthetic together. Simple and timeless. 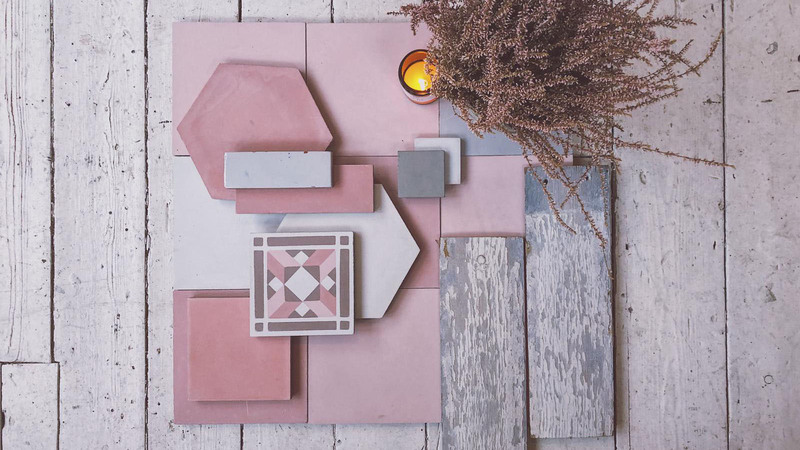 To launch the new pretty Palma tile we are looking for a hallway to tile and style. Email ruth@bertandmay.com to find out how we could collaborate together. As head of brand at Bert & May I am always on the look out for new and inspiring spaces to showcase our aesthetic. I’m looking for a hallway for the Palma to make it's grand entrance. We will supply the tiles at 50% discount and our creative team will come along after you have fitted the tiles and style the space and shoot for our quarterly magazine. Email me ruth@bertandmay.com with a photograph and some details of your space and we will see if we can collaborate together. We are looking to complete the project in early Spring. Samples are now available to order. Contact design@bertandmay.com or call 0203 744 0776 for more information. 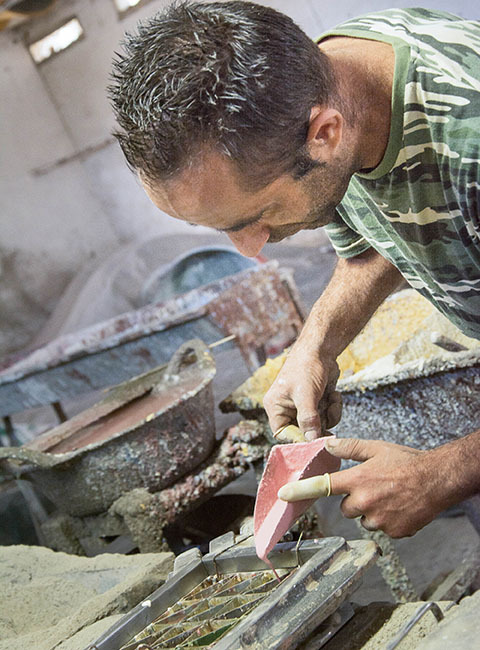 The Palma, like all our handmade tiles has been developed and curated in Spain. The mould has been made smaller than our normal tiles. There are intricate details in the mould creating a beautifully crafted design. 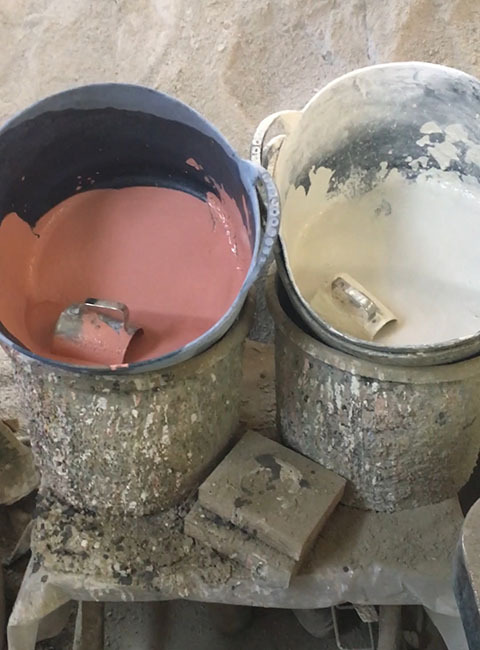 The raw material is gathered from a mixture of sand, cement and natural pigments and are all hand blended together. We add crushed marble to enhance durability and to give our tiles their distinctive raw finish. The mix is bespoke for each run of tiles we create giving you a truly unique finish every time. Due to the intricacies of the tile and that each individual element is poured by hand the Palma takes a little longer to produce than some of our more simple designs. It can take ten minutes to just make one tile then it takes up to 2 to 3 weeks to bask and dry in the warmth of the Spanish sunshine before being ready to use.